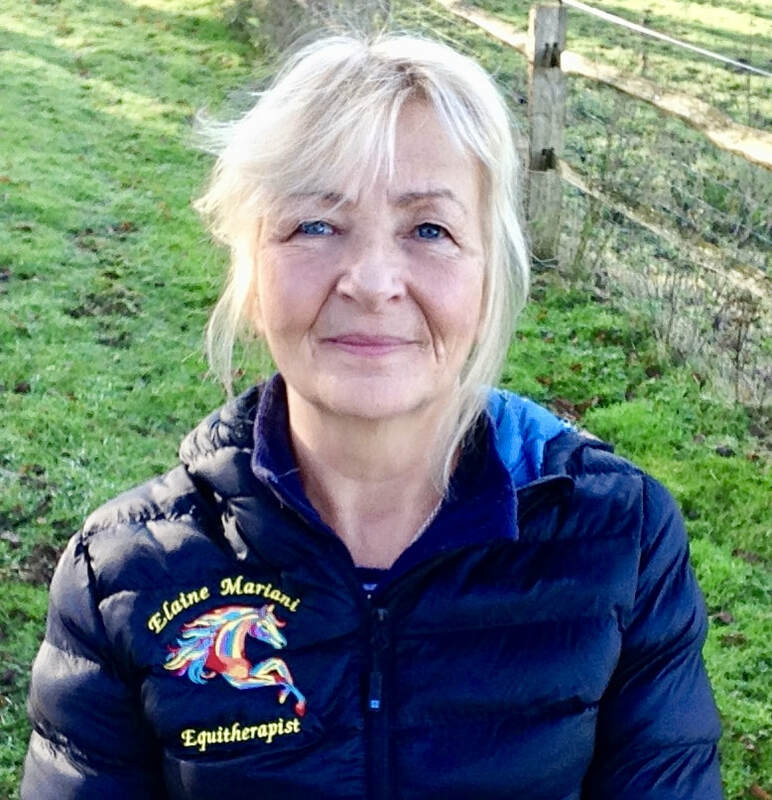 ​I am fully qualified and insured and am a full member of the Professional Body - the Equine Sports Massage Association. I am also a Straightness Training Mastery Student with Marijke de Jong. Each horse (and owner) is treated as an individual and the service I provide on each visit will be tailored to you and your horse's specific needs. The needs of a retired horse will vary considerably from a horse in full work - each are given equal priority and time but in different ways. I can offer a full postural assessment - static and in movement - and advice on how to improve symmetry and muscle development. Having assessed your horse I will do a 'whole horse' palpation to determine areas of tension/spasm/heat/pain etc. I will use a variety of techniques to help your horse, including sports massage techniques, myofascial release, stretches - passive and active, postural exercises. If deemed necessary I will follow up with Low Level Laser therapy or deep oscillation massage using the Physiopod or the SCENAR device. (Please see links in the menu to pages where these devices are explained in detail). I will explain my findings and where appropriate will discuss possible exercises to benefit your horse. If required I will provide a full written report of the session for your records. ​Why should you choose equine sports massage for your horse? Anyone who has experienced discomfort as a result of muscle spasm or muscle fatigue will know how it can affect attitude to and enthusiasm for life. Massage therapy can help alleviate muscle fatigue and spasms, reducing the risk of further injury, and helps induce relaxation by relieving tension thereby reducing the risk of over-using other muscles that compensate for any discomfort. Massage can play a significant role in restoring the horse to the most efficient use of his body after injury and in making the horse comfortable in his own body. If your horse is exhibiting behavioural issues or decreased performance due to physical discomfort caused by tight muscles or muscle spasms, massage therapy can help create a better balanced horse mentally, emotionally and physically. Equally, if you just want to pamper your horses, as with humans your horse doesn't need an injury to have a massage - because they are worth it. As a fully qualified and insured Equine Sports Massage Therapist I can help your horse to reach peak condition and stay that way. I am based in East Sussex and also cover parts of West Sussex, Surrey and Kent. In addition to traditional sports massage techniques I am also able to offer additional therapies which enhance and work alongside massage, including myofascial release, acupressure, equine stretch techniques, Low Level Laser Therapy using the Omega Low Level Laser Therapy System and red light/photonic torch therapy. I have recently trained in human SCENAR therapy and am also qualified in Equine and Small Animal SCENAR therapy. SCENAR - the aim of SCENAR therapy is to induce the release of enough neuropeptides to relieve pain and initiate a healing sequence through the body's own active feedback mechanisms. ​I am also qualified as an Applied Zoopharmacognosy Practitioner - I studied with Caroline Ingraham, founder of the Ingraham Academy of Applied Zoopharmacognosy. I also offer DEEP OSCILLATION® massage using the PhysioPod®. Please contact me to book a massage for your horse or to discuss further. It is a legal requirement that anyone treating an animal must have veterinary permission to do so - Veterinary Act 1966. I will contact your vet to request permission to massage your horse prior to the appointment. If during an assessment a horse presents with symptoms which may require veterinary attention (such as lameness), I may decline to proceed with treatment until veterinary advice has been sought.